Directorate General of Civil Aviation Arun Mishra on Thursday allowed lessors to take back 15 de-registered Kingfisher planes. Another three de-registered planes belonging to Los Angeles-based International Lease Finance Corporation cannot be taken back as litigation is on, said Mishra. The litigation over these three planes is on because Kingfisher had partly financed the purchase of these planes. This decision comes after the DGCA’s meeting with Airports Authority of India and the civil aviation ministry. Mishra said, “We would meet tax officials and airport operators on Tuesday to discuss issues related to other planes leased by Kingfisher, whose aircraft have been grounded for months by a cash crunch. However, India, being a signatory to Cape Town convention, has to comply with that. According to this convention, in case of a default, lessors will have the first right to claim back the plane. 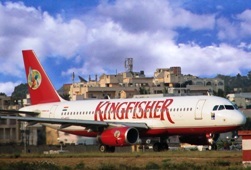 International Lease Finance said on Monday it had removed one of six aircraft stranded in India by the dispute over the suspension of operations at Kingfisher Airlines. Kingfisher has 42 planes. Of those, 17 have been de-registered and none of the lessors has claimed the rest. Financiers have warned that failure to resolve the dispute between creditors over the grounded carrier's unpaid bills could starve India of funds needed to develop its aviation industry. Kingfisher, controlled by liquor baron Vijay Mallya, has been halted due to a cash crunch. Lenders have been trying to recover $1.4 billion of loans in default, but disagreements over who should take precedence have left the jets stranded. Most EXPENSIVE ice cream cones around the world!